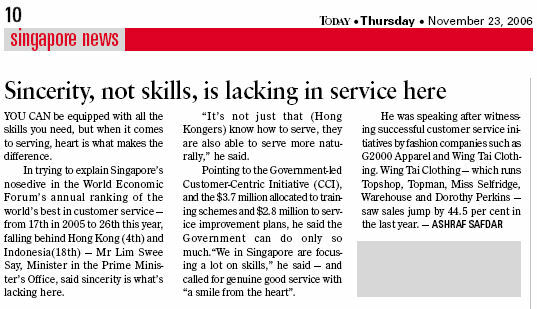 Saw this article in TodayOnline and the news of our lowly ranking as far as Customer Service is concerned doesn't surprise me. While it has to be said that the "Ugly Singaporean" customer too have to shoulder a portion of this predicament, the main bulk of it nevertheless, still fall on the side of the service provider. That is not to say that our customer service standard is really that bad but merely more of a fact that we can do better when we have the potential but we have not done so. A big part of it is due to the lack of empowerment that top management entrust to the front line. Front line customer service provider only serves up to what is required of them but never above and beyond. Hence, back to my earlier topic of The Sitting Duck vs The Soaring Eagle. There are 2 rationale for this. First, the "don't-be-a-hero" mentality prevails heavily in their mind. The fear of repercussion as a result of being looked upon by management as being a "smart alec" or "geh kiang" in local speak. The second is the fear of taking up "unnecessary" responsibility. How often do we encounter customer service personnel getting all defensive and clammed up when all we did were merely just asking for their names? Following this train of thought and it eventually led me to thinking about Singapore Airlines vs Cathay Pacific. Both are excellent airlines but instead of doing the patriotic thing and support my own national carrier, my heart goes to Cathay Pacific. There is a difference between good service and great service. On the whole, I can't fault Singapore Airlines for they are an excellent carrier, collection top accolades year in, year out. The service staff are very professional and of very high standards. But behind that smile, I couldn't help but feel the coldness behind the facade. It seemed fake and plastic. It is really sad that when you are at the receiving end of a service with a smile, you doubt if that genuinely came from the heart? With Cathay Pacific, there's never a doubt. You feel happy just to come aboard. The warmth of the friendliness transcends throughout the cabin regardless if you are in First, Business or cattle class. Sure there will be those who would totally disagree with me but it is nonetheless how I feel all these years of traveling. As a Singaporean, I do wish for Singapore Airlines to do our country proud. However, unless we can turn on the warmth inside the Singapore Girl, we shall unfortunately remain only a good airline. Not a great one. I am surprise LSS said tat! ha =.=""
I don't think it's specific to singaporean customer service providers to be fair, but since we're talking about singapore in this context, then I'll have to agree with you. Having said that, when you talk to SIA customer services on land-side in the UK, they are usually fine (then again, they tend to be the 'locals', ie, the 'angmohs/non singaporeans'). I've not flown SIA for a while now, mostly because I've not been home - the last few flights I've taken have been European carriers, and I must say, they are really improving. Sunflower: It's hard to ignore it when it is stark in front of you. Deny it would have made him look foolish. AKK: Nah... I think I'll pass. Not too thrilled with the idea of having melted plastic on my skin. Pam: In my context, I refer to the local Singapore staff that render the various services. Again, I would have to say that not all are bad, I have come across certain gems along the way. Equally, I have also encountered some of the worst customer services in countries that were supposedly known to have high customer service standards. I agree that Cathay Pacific is much better service-wise. Food-wise, Singapore Airlines wins hands down though. But for the level of service Cathay Pacific, Emirates and Thai Airways top my list. I'd take these 3 any day over SG Airlines. Sheena: Personally, I don't care about airline food coz with the pressurized cabin, your taste buds are pretty much shot anyway. Just as long as they are not rubber bands served in the guise of yee foo noodles, by Ch1na Airlines can already. Even if SQ and CX are identically on par with each other, I would still choose CX for the prior is just too expensive. 1. Service of other airlines catching up fast. Really fast. Asiana (Korean) for instance is solid. 2. SQ gals getter shorter and uglier. Asiana's Korean stewardesses are model grade. Damn friendly some more. Today, If I don't follow the directions of my loins (which means I'll choose Asiana anytime), my loyalties are still with SQ. Gimme 5 years, the converse may be true. Forgot to add. I don't care if SQ smiles are genuine or fake. Just give me my gin and tonic fast, smiling. Meepok: You can afford to be loyal to SQ because your air ticket charge to Ah Gong siao one. Folks like me are always on the lookout for best value for money of which SQ is not, unfortunately.